This is a common music theory question about learning pentatonic scales for guitar that basically asks whether or not there is a “correct” way to finish one pattern and then start the next. In addition, some guitarists wonder if they should connect the patterns in a continuous manner so that they don’t skip or repeat any notes. The answer to both questions is no. Players should just play up and down a pattern in one position and then move up the guitar neck to the next, restart, and play up and down the new pattern in the new position. At this stage you’re just trying to train yourself to access the scale notes in any position, or “map out” the guitar fretboard. After you have memorized and can play all five pentatonic scale patterns ascending and descending you need to transpose to new keys and practice connecting the patterns again. The final step is to put the patterns to use by learning lots of pentatonic scale songs. Pentatonic melodies, riffs, lead guitar solos, and bass lines will be in various keys and move through the patterns in various ways including starting and stopping, reversing direction, skipping and repeating notes, and shifting positions. 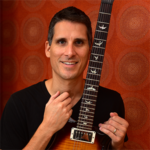 Through this song learning process you’ll develop a practical understanding of the guitar theory behind applying the pentatonic scale, both major and minor, to different music styles.